Reviews » Theatrical Reviews » The Informant! Steven Soderbergh's The Informant! is one of the best movies of the year. I can confidently say that at this late date without having to add the "for now" caveat that overzealous reviewers always have to add when the calendar is still fairly new, but even if it were February right now, I'd still be confident in the assertion. 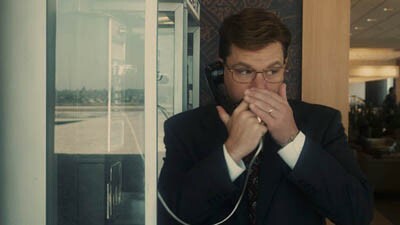 Steven Soderbergh's The Informant! is one of the best movies of the year. Period. The Informant! is the semi-true, semi-fanciful account of Mark Whitacre, a whistleblower who exposed price-fixing amongst manufacturers creating a specific kind of high-fructose corn syrup. That in itself is enough for accolades, but it's what happened after that is the real reason why Kurt Eichenwald wrote a book on the subject, why Scott Z. Burns (The Bourne Ultimatum) adapted it into a movie script, and why Matt Damon is starring as Mark in the Soderbergh production of the same. Mark is not the guy you think he is. Mark is not even the guy he thinks he is. The movie begins like any other thriller: normal businessman Mark Whitacre gets a phone call from a Japanese competitor asking for a big payoff in order to expose a corporate spy. Mark tells his bosses, and the FBI is called in. When Agent Brian Shepard (Scott Bakula) comes to Mark's house to tap his phone for the next time the blackmailer calls, however, Mark tells him there is more going on. His company is conspiring with their competitors around the world to raise the prices on their products, costing the American consumer a variety of added charges. $0.05 per soda adds up to a lot of nickels taken dishonestly. Sensing a real case, Brian and his partner Bob Hendron (Joel McHale) set Mark up to start taping conversations pertaining to the illegal activities. Mark is gung-ho, but then gets cold feet, the beginning of many reversals on his part. The agents stuck with it, though, and in 1992, began a 2 1/2-year undercover sting with Mark as their main witness. The case is successful and...well, here is where my job gets hard. I don't want to tell you any more about what actually happens, because this is one of those movies that will be more enjoyable the first time the less you know going in. And the fun of the second viewing will be spotting how many swerves you should have seen coming and that you missed. Suffice to say, Mark is a mercurial creature, and nothing is ever as it seems. Soderbergh stages The Informant! like a cross between a 1970s movie like The Conversation, a film he pays tribute to in the opening credits, and a more classic screwball comedy. Though there isn't any slapstick in the movie, it still has an underlying tone not dissimilar to a Blake Edwards or Billy Wilder picture. Soderbeegh even hires legendary composer Marvin Hamlisch to provide him with a wickedly ironic score, a witty combination of the kind of goofball music Hamlisch did for early Woody Allen comedies like Take the Money and Run and Bananas and the action-danger-suspense tunes he whipped up for The Spy Who Loved Me. It's not just a cute conceit, either, a wink from a director who wants to let you now he's in on the joke. It's actually slyly appropriate to Mark's character. Like him, the music is disconnected and totally with it at the same time. Matt Damon has been in a few comedies before, but nothing as appropriate to his level of skill as this film. Hiding under bad hair and a moustache, and having put on weight and used prosthetics to appear out of shape, Damon is convincing as a small-town shlub who is in over his head. The intrigue scares him, but he also likes it, he gets to play along with the cops in a game of cops and robbers. Damon does stupid well, but his more dramatic chops also help him sell Mark as sincere. His best moments, though, occur off screen, delivering a gloriously loopy voiceover that emphasizes the disconnect that is underscored by the music. The random thoughts this guy has are totally unrelated to what is happening right in front of him, though this serves its purpose, too, giving us more insight into what kind of game Mark has been playing when those thoughts finally run out. The supporting cast is filled out with perfectly chosen actors all delivering spot-on performances. Bakula, McHale, and Melanie Lynskey as Mark's wife all support Damon by playing it cool around him as his antics alternately seduce and exasperate them. Patton Oswalt, Arrested Development's Tony Hale, and both Smothers Bros. all also appear in smaller roles, demonstrating just what kind of talent Soderbergh had to work with. 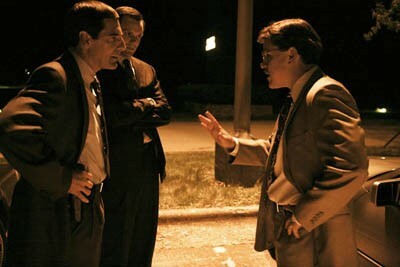 Soderbergh shoots them using a lot of the handheld, pseudo-documentary techniques he has been honing over the years, working with a drab color scheme of corporate browns and sickly oranges to give the film the dull pallor of business life in Middle America. He also knows when to stick to less attention-grabbing, straight-ahead compositions when solid storytelling is required. It's the kind of dexterity that in my mind makes him one of our more interesting directors. Keep in mind, this is the third movie he's had released this year. The last two were the scaled-back verite of The Girlfriend Experience and the two-part epic Che, itself separated into two halves by two distinct styles. All were hits with me, and the fact that Soderbergh keeps returning with new tricks is just astounding. Truth be told, I've been feeling let down by movies in the last couple of weeks. Most of the new releases I had been looking forward to have not met my expectations. The Informant! not only met them, but it exceeded them in the most dizzying of ways. This is a real winner, folks. Whatever other movie you thought you were going to see this weekend, forget it and go see The Informant! instead. Buy tickets to "The Informant!" now!